My Serengeti Safari – About Us. Born and raised in Tanzania, Joseph Bumi has been a part of Africa all his life. His English skills are great, and his demeanor the best it can be. Be sure to read our testimonials to see what others have to say about our experience, but more importantly, their experience! He is from Southern Tanzania at (Iringa Region), along the escarpment of the great African rift valley and he spent his childhood as a lover of the wild. As he grew up in his village he began a great bush experience. This experience encouraged him to join training courses for wildlife guides and to continue his training with courses conducted by wildlife experts. 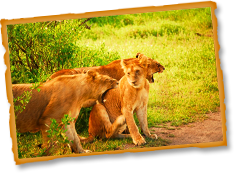 He has guided several safaris for world renowned media publications including National Geographic. As a Pare, he has an excellent knowledge of the culture and local community life in Tanzania. With his 11 years as a safari guide he manages our team of guides to ensure that all My Serengeti Safari clients have the trip of a lifetime and discover the amazing ecology, wildlife and wonders of Tanzania.